Last summer, we had the chance to catch Texas guitarist and singer Jonn Del Toro Richardson as part of the Project Blues event in Columbus, Ohio. 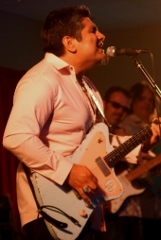 A 2005 International Blues Challenge dual winner, both as a member of Diunna Greenleaf‘s Blue Mercy band and the competition’s best guitarist, Richardson has always served as either a sideman (including a spot on the Blue Shoe Project’s Grammy-winning Last of the Great Mississippi Delta Bluesmen, where he backed the legendary Pinetop Perkins) or collaborator – as in the case of his Drivin’ Me Wild CD with fellow IBC winner (2007) Sean Carney, as well as a 2011 album Time Slips On By with mandolin player Rich DelGrosso – but is currently in the process of recording his first solo album in Austin, Texas. The album will be produced by a famous name in Texas blues, Anson Funderburgh, with 20% of revenues from the CD going to Project Blues (of which Richardson is a founding artist) to help provide mammograms and other assistance to women and families in need. Here’s the link to Richardson’s campaign for the album on Indiegogo, which we’re honored to note includes a photo taken by yours truly at last year’s Project Blues event. With nearly 90% of the goal already raised, Jonn’s looking for just a little more help over the coming days to push this project forward, with hopes of some pretty high returns come next awards season! This entry was posted in Crowdsourcing and tagged Anson Funderburgh, Jonn Del Toro Richardson, Project Blues. Bookmark the permalink.